Used to stiffen the sole of the shoe. Limits Range of Motion of the Forefoot and Midfoot. Extremely thin steel stabilizer plate insole, 1/8" thick. Comfortable and durable felt top cover. 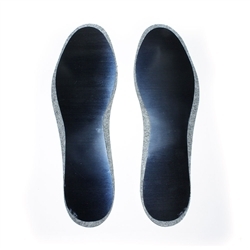 These steel insole plates are constructed to Limit Dorsiflexion at the metatarsal joints. Immobilizes toe joint to prevent it from bending during walking and sports. Be sure to review our orthotic molding guide for more information. My orthopedic surgeon recommended the steel plate insoles from Atlas Biomechanics to treat my metatarsal pain. They made a huge difference on my morton's toe and arthritis. Thanks.